David Miyasato and his daughter, Abigail, who was born in March. A Kauai resident who was discharged from the Army in 1996 but recalled recently has been granted a 30-day exemption from reporting for active duty after he filed a federal lawsuit charging that the Army's mobilization order was illegal. David M. Miyasato, who served in the 1991 Gulf War, said he was surprised on Sept. 18 when he received orders to report to Fort Jackson, S.C. on Nov. 9. 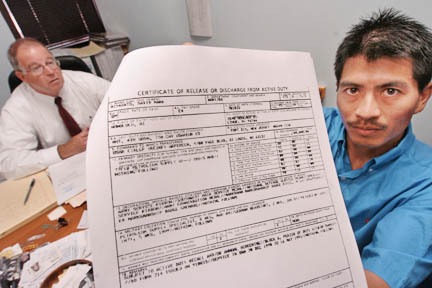 Miyasato, 34, said he believed he had completed his eight-year obligation with the Army in 1996. "It was really a shock," Miyasato told reporters yesterday. "My family took it really hard for the first week. They were really confused over what was happening." He and his wife, Estelle, have a 7-month-old daughter, Abigail. Miyasato said he never re-enlisted, signed up for any bonuses or was told that he had been transferred to the Individual Ready Reserve or any other Army Reserve unit. Miyasato, who started an auto-tinting shop in Lihue two years ago, said he wrote to the Army pointing out that his enlistment had ended in 1996 after he served three years on active duty and another additional five in the inactive reserve. When he received no answer from the Army, Miyasato turned to U.S. Rep. Ed Case and Sens. Daniel Inouye and Daniel Akaka to help him. Miyasato said Akaka and Case were told by the Army that it would take 60 days to conduct an investigation. Miyasato said going AWOL was not an option, so instead he hired attorney Eric Seitz, who requested a restraining order from the federal courts. Seitz said he "wanted to fight the matter here" and didn't want Miyasato shipped to any Army post where he wouldn't be able to communicate with him. Within hours after Miyasato filed his suit yesterday morning, the Army responded saying that his "exemption from active duty had not been finalized at this time" and he was given an administrative delay for up to 30 days. David Miyasato showed his discharge papers from the Army yesterday. Attorney Eric Seitz, left, is helping him with a lawsuit that seeks to keep Miyasato from returning to active duty. An Army spokeswoman at the Pentagon told the Star-Bulletin last night that the military wasn't ready to comment on the matter. Miyasato enlisted in the Army in October 1987 before he graduated from Kauai High School in 1988. He was assigned to the 3rd Armor Division in Germany and was sent to 4th Squadron, 7th Cavalry. Before Christmas in 1990, his unit was deployed first to Saudi Arabia. It then joined the ground war in Iraq and was sent to Kuwait for a month. He served as an Army petroleum supply specialist and a truck driver during the war. Miyasato said that on Aug. 15, 1991, he received an honorable discharge. He said he tried calling and writing to U.S. Army Human Resources Command in St. Louis, but never received a response until yesterday. Miyasato surmised that he may have been picked because he was trained as a truck driver and refueler -- both skills that are in high demand in Iraq. He told reporters his job is the same as that done by 18 Army Reserve soldiers who last month defied an order to go out on a convoy, in part out of concern about a lack of armor. Seitz noted that the Army has no claims to Miyasato because he served as a soldier whose enlistment ended in 1996. Unlike officers who serve indefinitely until they resign their commission, Miyasato has finished his commitment, Seitz said. After 1991 and while he was in the inactive reserve for five years, Miyasato said he would have been willing to serve if he had been recalled then. "Being out 13 years now and eight since my obligation ended," Miyasato added, "it was something I never thought of." Miyasato said he also believes he shouldn't have been placed in the Individual Ready Reserve where 4,166 soldiers received mobilization orders in July nationwide. Of those, 843 have neither reported nor asked for a delay or exemption, according to the Army. Members of the Individual Ready Reserve are rarely called to active duty. The last time was 1990, when nearly 20,000 were mobilized. They are people who were honorably discharged after finishing their active-duty tours, usually four to six years, but remained for the rest of the eight-year commitment they made when they joined the Army. Seitz added: "As a legal matter, he served his enlistment commitment. It was an eight-year contract. It's done." As for his feelings on the Iraqi war, Miyasato said: "The Iraqis are having a hard time with their leadership and their government. We got Saddam, but now they have no foundation ... Now we might have to be responsible to get them back on their feet."